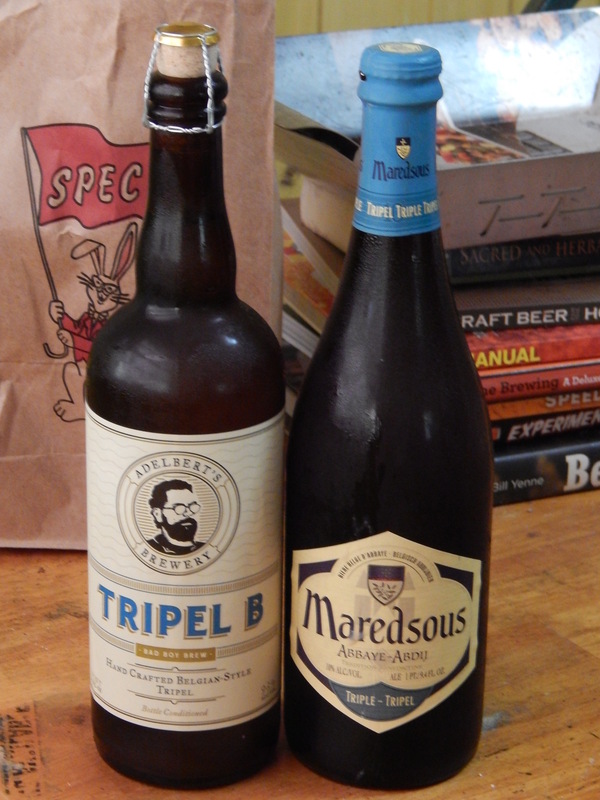 The recipe for tripel is downright simple. And, wort production is not that elaborate (at least compared to, say, a multiple decoction mash). Fermentation, however, can get a bit tricky. A tripel wort starts at a fairly high original gravity (in the ballpark of 20 °Plato/OG 1.080), and contains more simple sugars than an all malt beer. Even with an appropriate amount of yeast nutrients added, the yeast have a tough fermentation ahead of them. In cases like this, the usual recommendations would be to pitch a large amount of yeast, aerate thoroughly (and perhaps more than once), and keep the fermentation temperature in check. The last recommendation would be to ensure that ester production was limited to a reasonable amount, something that can be a problem in big beers —especially if they are fermented too warm. However, in a tripel, you also want your Belgian yeast strain to show some it’s “spicy” phenolic character. When that’s the case, the usual recommendations are to underpitch slightly, limit aeration, and let the fermentation run a bit warm. So, to get the absolutely best tripel fermentation, you have to split the difference. And there are a number of ways you can do that. All three of the variables I mentioned — pitching rate, level of aeration, and fermentation temperature — affect the outcome. And theoretically, there are many combinations that could yield good results. I recommend aerating your wort as you usually do, and using the pitching rate and fermentation temperature to get the fermentation characteristics you desire. If you limit your pitching rate — say to between one half and three quarters of the standard optimal rate — and aerate thoroughly, you’ll be slightly underpitched, but the yeast should all be healthy. If you underpitched and limited aeration, the potential for a sluggish or stuck fermentation would increase. Don’t over do your underpitching; especially, don’t think you can underpitch to any degree and just pitch a bag or tube of liquid yeast. Figure out the pitching rate you need and make the appropriately-sized starter. You could experiment with fermentation temperatures until you find one that gives you the right character, given your pitching rate and level of aeration. Or, you could allow your fermentation temperature to rise near the end of fermentation. The latter option is frequently chosen by homebrewers who brew Belgian style beers. For example, if you’re using the Wyeast 3787 (Trappist High Gravity) or White Labs WLP530 (Abbey Ale) yeast, beginning the fermentation in the 64–67 °F (18–19 °C) range, then letting it rise to 70–72 °F (21–22 °C) near the end of fermentation has worked well for me. Allowing the temperature to rise at the end can also help finish the beer. Each “Belgian” strain of yeast has a different character and responds to differences in pitching rate, levels of aeration, and fermentation temperature in a different manner. In general, yeast strains that produce more yeast-derived aromas and flavors in beer tend to be more sensitive to the details of fermentation. The little details — perhaps even down to the level of your homebrew setup — also matter. Little things, including, when exactly do you start letting the temperature rise, can have an influence on your beer. One thing to keep in mind when you try your first triple — either use a fermentation plan that has worked before (as in the one above for Wyeast 3787/White Labs WLP530) or err on the side of a cleaner beer. If you are experimenting with a yeast strain that is new to you, keep in mind that a tripel that is “too clean” is going to be much preferable to a tripel with an excessive amount of yeast derived aromatics. (And it’s certainly better than experiencing a sluggish or stuck fermentation.) Don’t go nuts with restricting the pitching rate and letting the fermentation temperature climb your first time around. Try to pick a reasonable middle ground — based on your knowledge of the yeast strain — and work from there. Although a tripel fermentation may be more tricky than your average ale fermentation, it’s not rocket science. Take good notes of every aspect of your first tripel fermentation, then taste your beer carefully and take good notes on your tasting. Use these to guide your changes the next time you brew.